The LONG signal was generated the first week in May and is still operative. Note how the character of the market has changed, from a declining, subdued trend to a rising, volatile, broad-ranging trend. Note also how the initial surge (Wave 1) has now been retraced between 38-50%. It's possible for the retracement to reach 62% before ending, but VXX is in its Fibonacci window of reversal now, so any dramatic rise in volatility will likely resolve into a Wave 3 advance with inverse implications for the stock market. is it also possible that wave 1 has not yet finished? or is the retracement to high in volume to ignore as a wave 2 down? This company owns the rights to an anti-viral that can wipe-out all viral-based disease on the planet. First, I declare that I own the All Allan requisite number of NNVC shares. But, respectfully, Allan, don't you think you are being a little zealous about this company? Some time ago I briefly mentioned my experience getting into a private placement deal with a biotech company that had this awesome patent on a technology that "tags" retroviruses like HIV. That patent, for all I know, may yet prove to be a goldmine to whoever owns it now, after the company's bankruptcy after 7-8 years of business life. 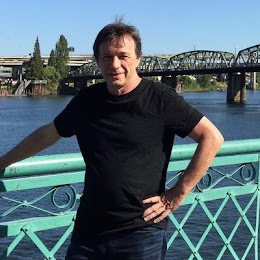 My due diligence, with Allan's help, leads me to believe the people running Nanovirices are good, honest competent people, with very promising technology. But it wouldn't surprise me one iota if my shares DID become worthless one day. I invested because it's a potential goldmine, but there are several of those, private and public, in the biotech domain. The business of biotech is quite simply treacherous, and by now I don't see incontrovertible evidence that NNVC will become a 50-200 billion dollar company one day. It might become one someday, sure. Just my perspective on NNVC as a person who's been holding shares with a good gain for over 2.5 years. And I'm generally a very patient guy who can afford to wait and see what develops. A term used by the Securities and Exchange Commission (SEC) under Regulation D to refer to investors who are financially sophisticated and have a reduced need for the protection provided by certain government filings. In the second clip, Steve Wynn discusses taking an "abandonment loss" of $13 million on a recently built facility, in order to completely remake Wynn Encore for a new market focus, which is responsive to new market trends. This flexibility is equivalent to what is required in trading markets. It is a flexibility borne out of also having a long term portfolio management within which one executes trades to win--to harvest capital gains and losses both!! There is a lot here in this interview that is useful, particularly his 'uncompromising commitment to excellence'. Lastly, there is something very spiritual about what Wynn is doing and saying. In his own little [sic.] way, he is not unlike the Creator in Genesis. When trading markets is done good, it is done this same way. I am curious as to what you think on this. 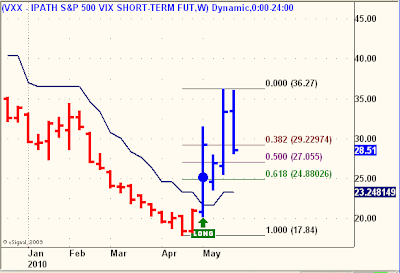 VIX went up as much as 8% while VXX only garnered 2%+ today. At the last half hour while VIX swing wildly, VXX actually went down. It didn't not rise until last few minutes of closing. Is this end of month effect? I would say "yes,but what if"
which means market bottoms were strongly rejected. As hard as the market sailed down from the top it appears to be rushing upward just as strongly. The only thing hanging over the thought process like a dark cloud is the elliott wave counting. 5 waves down.but then again it also looks like 3 waves down ABC. you gotta just love/hate elliott wave. maybe the support resistance lines are more important. lots of things need to be respected but one of them is this S+P 1040 zone. a definite line in the sand. strong S/R point at 1090. whats 1090? 50 % between 1040 and 1140.
dowward plunge started at 1205 on may 3rd. Wave 1 stopped at 1158 on may 5th. That distance Plus 162% = 1081...what I see as the real wave 3 completion point....That spot is exactly on the 200 MA. wave 4 I see as the low of may 14th = 1126...That point connects a perfect line from Feb 4th low at 1062 thru the middle zone of where a true wave 4 'ought to be'...This line tops out next week at the 1142 area. I see wave 5 down from the energy point of 1126 to the 1040 bottom. Biggest resistance is the 1100 area at the 200 MA. If I see any of these points featured prominently in your charts I'll be sure to take heed. Thats the magic line in the sand I think I see at this point. But first 1100 has to be overcome and has to hold up as support. then its 1126.